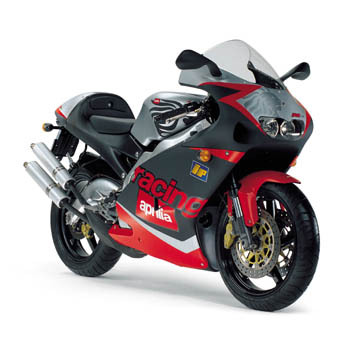 End of the line...Apparently because of Suzuki's ceasing production of the VJ22 RGV250 engine, due to tightened emissions regulations, Aprilia stopped making RS250s in 2003, and the bikes were no longer allowed to be sold as new in Europe as of early 2004. Engine: Type 90-deg. V, 2-cylinder, 2-stroke with laminar suction and exhaust valve. Separate lubrication with variable automatic mixer (0.9/2%). Liquid cooling. Wheels (light alloy) Front: 3.5 x 17 in. ('94-'97: 3.0 x 17 in. ); rear: 4.5 x 17 in.